It usually takes about four starts to get this first sentence right, and we are on number three, so I guess that we are off to a good start. The ability to hate blindly without knowledge of background or history can be one of the most dangerous forces on our planet. It stifles, burns, and takes the very fabric of humanity and what is good in the world and puts in a dark place. I hate racism, but I do not hate the racist. I do not understand its purpose, and I do not understand the mind of the ignorant fool. I learned that the best way to fight ignorance is with intelligence and the tools and talents you are blessed with. Combine those and sprinkle in a little bit of wisdom, and you have yourself an unstoppable force. It is funny how God will direct your path in the midst of your distractions, and allow you the opportunity to see a light in spite of the negative things that surround you. I was distracted yesterday and I was redirected, and I am extremely thankful for that. My photography goal for yesterday was planned a few days ago, which included a sunrise photo from Ladybird Johnson Park, and a meaningful photo for this blog that would have had something to do with the state of our country and racism. So that's just what I did yesterday. I started out at about five in the morning, headed to DC, picked a pretty good spot right across the Potomac and took the photo that you see below. This is where my distracted day began - With this freaking picture! I took this photograph and went home to edit it and my wife was like, "are those flowers dying?" I truthfully did not notice that when I took the photo, but after really looking at the photo those flowers look like sadness. The first photo on my photography plan turned out to be an epic fail, along with the other four that ended up being out of focus due to the combination of a long exposure and wind. I am truly sorry that I had to expose you to what we can title "Monumental Sadness With Epic Clouds". If you have been keeping up with my blogs, you know that it is now time for you to scroll back to the top to remind yourself as to what we are actually talking about here. Our subject for today boys and girls is "Distraction", and how it can overshadow the true ability to bring change when it can seem impossible to do so. My second photo yesterday was going to be the subject of a planned blog entry, and I ended up discovering something far more spectacular and inspiring. 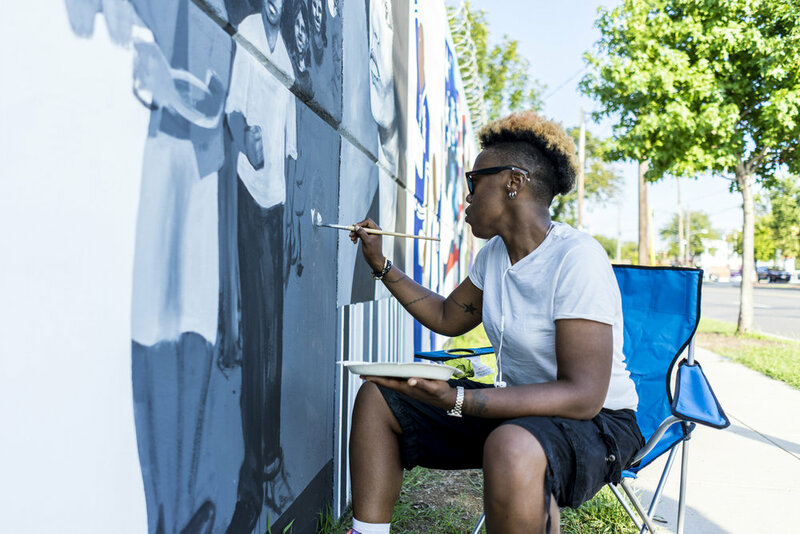 Located right on Nannie Hellen Burroughs Avenue in Northeast, DC is the Deanwood Mural. 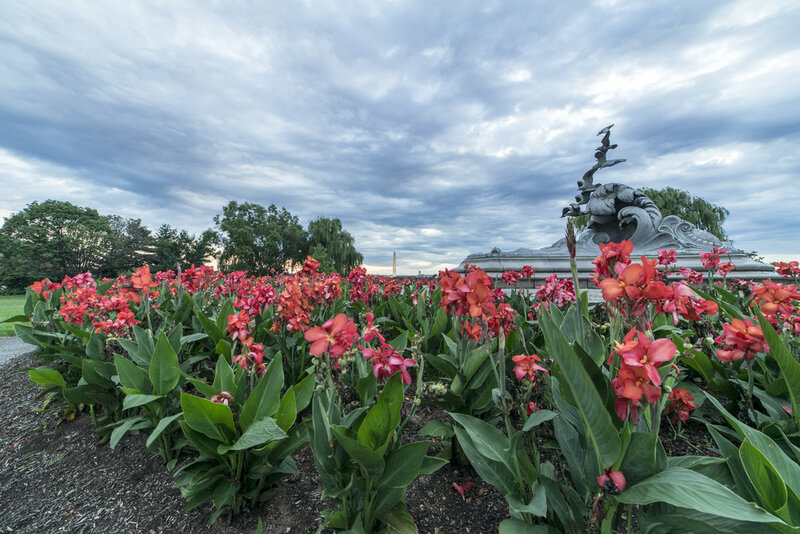 The original mural was created in 1991 by artist Rik Freeman and was sponsored by the D.C. Commission on the Arts and Humanities. 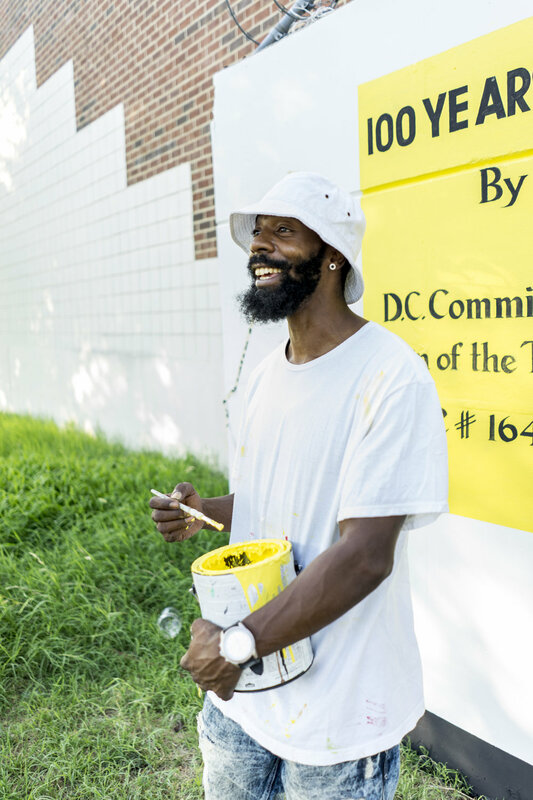 Mr. Jerome Johnson is the talented artists in charge of the revamping of the original work, which is scheduled to be completed on Tuesday, August 22, 2017. The mural displays 100 years of Afro-American history and includes; The Honorable Adam Clayton Powell, Rosa Parks, Jackie Robinson, Jessie Owens, Angela Davis, James Vanderzee, John Carlos, Tommie Smith, Nannie Helen Burroughs, Jimi Hendrix, Marcus Garvey, Dizzy Gillespie, Mrs. Minnie Hines Powell & Grandsons (Deanwood). I remember seeing this as a child. Looking back, it was one of my very first experiences with art created by an African American artist. It is an amazing feeling when you are able to fully appreciate things that you took for granted as a child. It is also amazing to find yourself in a position to be able to memorialize the history of your cultures positive achievements, and to inspire others to do the same. I actually met Mr. Johnson for the first time about a month ago, which was just as he started to work on the mural and I planned on writing about it, but could not find the words (I guess everything happens for a reason). I met three amazing artists yesterday, a few kids on bikes, John R. Thompson Senior, and a random guy on a motor scooter that really did not want me to take his photo (cuz was legit mad, made me delete the photo from my camera, and asked if I was the police). Mr. Johnson, and Jeff were at the far left end of the mural working on the lettering, and Candice was on the far right end, and was deep in her headphones when I started to take pictures of her, but she was cool about it and kept on painting. I try to do a little research on my subjects when I am writing, and I discovered how much of a talented artist she truly is and I think that you should definitely check her out. She had to stop eating her Chinese food to take this photo, but she was cool about it. Jeff was cool as a fan, and we spoke about putting focus East of the River which is a part of DC that often gets neglected. I asked him for a portrait and he was like "its going to be weird," then I was like "nah man its cool" and I did what I always do to break the ice... I asked him "do you like fried chicken" and this was the face he made. You can never go wrong with the fried chicken face. The purpose of this blog is to share with you the world through the lens of my camera, and the writing of my words. The things that I share with you come from my own heart, and I feel blessed to be able to share these things with you. My photos and words may upset you, cause you to be happy, and they may cause you to be sad. They might take you back to a moment in your life that you did not think that you remembered, and may even allow you to be inspired by the lessons that I learn in my photographic journey. Yesterday I learned that the world can be a sick and twisted place, and that you can either allow yourself to be distracted by the sickness and do nothing, or you can use your gifts to rise above hatred and ignorance to be that agent of change that the world needs. I never made it to that second photo, and I do not think that it would have served any purpose if I did make it. This blog entry would have been dark, angry, and pointless if I didn't make that right into that Wendy's parking lot. It would have contributed to the negative while attempting to invoke a positive response, which on its face really doesn't make any sense and feeds right into the fabric of being non-progressive. Me allowing myself to be distracted would have prevented my ability to share this with you. I had the opportunity to meet some amazing artists, and they are a reflection of that light that flickers ever so subtly, but provides a world of hope for all that are exposed. The beauty of art has long been a powerful tool that will always stand the test of time. 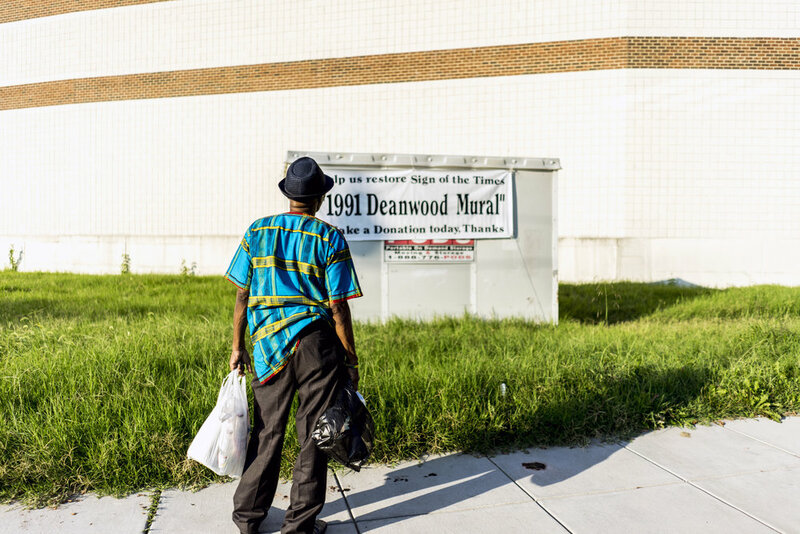 I grew up in Deanwood and I love what the Deanwood Mural stands for. One hundred years of progressive history is a true definition of how you can overcome any obstacle using the gifts of education, wisdom, hard work, and expression. The original version of this mural stood for twenty six years and I can remember that it ended with - 2000? A lot has happened between then and now, and we still have so much more to accomplish. I pray that we are able to be such a driving force today, that we inspire someone to once again paint the Deanwood Mural in the year 2043. I thank you so much for taking the time to read this, and I would encourage you to share this with anyone that you feel will be inspired by the photos and words that I have shared with you.